Two hundred children in Uganda will receive the gift of mobility, thanks to the work of a local nonprofit. Reach Out and Care (ROC) Wheels has partnered with the Uganda Orphans Fund to bring wheelchairs to severely disabled children. After an extensive two-year effort that included designing, building and refurbishing wheelchairs, ROC Wheels is ready to ship its latest batch of wheelchairs to Uganda on June 11. ROC Wheels has been helping severely disabled children around the world since 1999. With projects in over 20 countries, and more than 10,000 wheelchairs delivered to date, ROC Wheels has changed thousands of families’ lives. Hanson is the former owner of Leggaro, another wheelchair manufacturer in Bozeman, so he is no stranger when it comes to designing wheelchairs. All of ROC Wheels’ wheelchairs are designed to be as adjustable, durable and configurable as possible. The hope is that every child is able to use the chair for a minimum of five years, and the chair needs to be modifiable enough to adapt to a growing child in a rugged environment. The wheelchairs include 60 of ROC Wheels’ flagship “Rockit chairs.” Designed by Hanson, the Rockit chair is constructed from a kit. This simple assembly design is integral for ROC Wheels, as it allows for volunteers to easily construct the chairs. ROC Wheels will also be using 40 of Leggaro’s “Reach” and “Trak” chairs, as well as 100 refurbished wheelchairs that have been donated. In addition to delivering the chairs, ROC Wheels will bring a team of physical therapists, wheelchair fitters and other volunteers to assist with correctly fitting the chairs to every child. ROC Wheels has recently moved into a new, larger location near Four Corners. 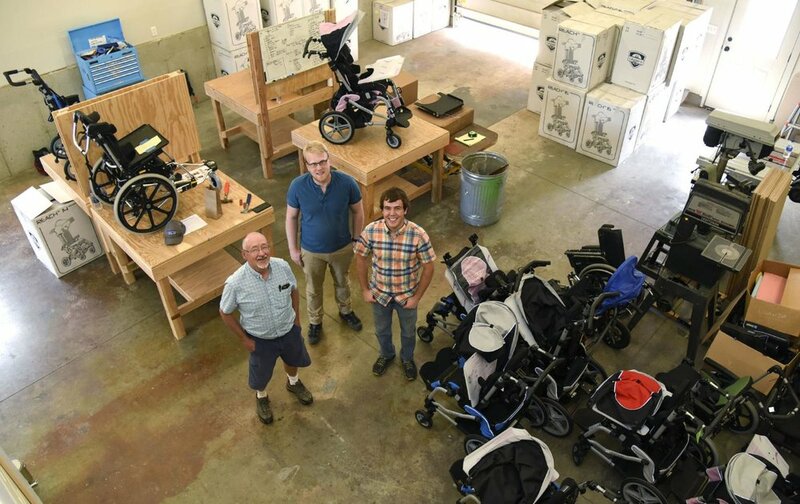 The additional workspace has allowed for expanded manufacturing and the addition of two mechanical engineering interns, Robert Knutson and Karl Swenson, to aid with designing and building wheelchairs. Beyond that, ROC Wheels is hoping to grow its Youth Empowerment With The Helper Spirit (YEWTHS) ROC program. The program is a youth outreach already present in 17 schools. It aims to engage local kids in the community, providing volunteering opportunities to help construct wheelchairs, and even trips to help distribute the wheelchairs to kids in disadvantaged countries.